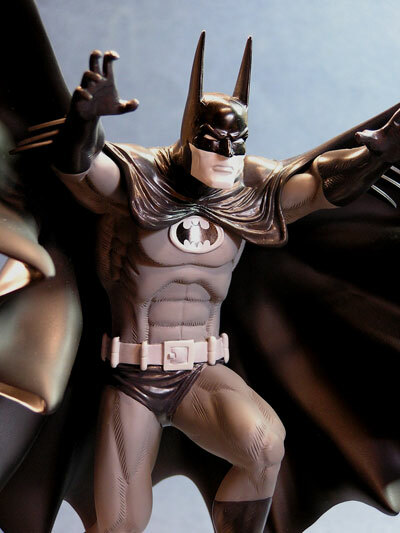 Dan Gates joins us tonight with a look at the latest Batman Black and White statue - take it away, Dan! 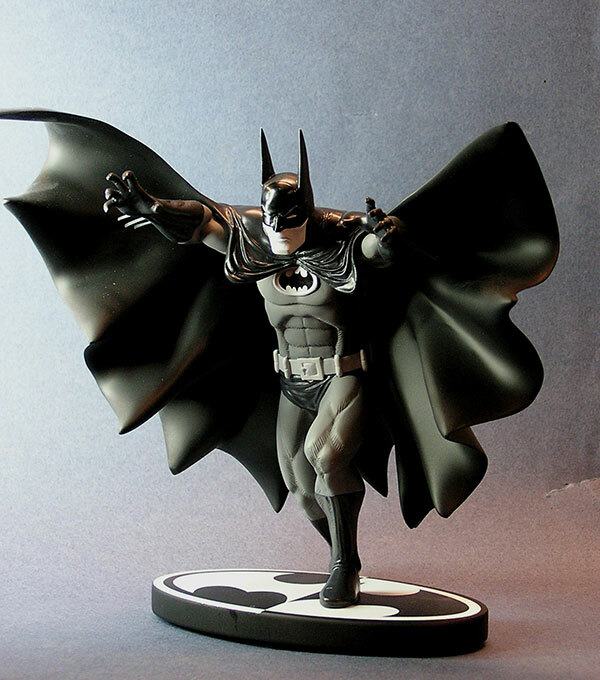 The latest in DC Direct's successful line of hand painted, cold-cast porcelain statues is the Batman Black and White statue based on the art of Marshall Rogers and sculpted by Ray Villafane. This edition is limited to 2,500 pieces and can be purchased from $55 to $70. A word about the artist upon whose work this piece is based: Marshall Rogers was the preeminent Bat-artist in the late 1970's. Along with writers Steve Englehart and Terry Austin, Marshall created such Bat-classics as "The Laughing Fish" (Detective Comics #475) and the trade paperback "Strange Apparitions" among many others. His film noir-ish style, attention to architecture, and dark color palette influenced the looks of Tim Burton's Batman and the Batman Animated Series. Sadly, Rogers died in 2007 at the age of 57. This fan-beloved artist is now being recognized in this popular series of statues. Ray Villafane is the talented sculptor who also gave us the Kelly Jones version in the same line. The same as most - a black and white printed box showing photos of the statue. DC Direct has taken Captain Toy's advice and included artwork by the artist on at least one side panel. The styrofoam inserts adequately protect the unassembled pieces. We have an action pose here and whether you're a fan of action poses or not, I believe it is essential in this case to capture Roger's artistic essence. 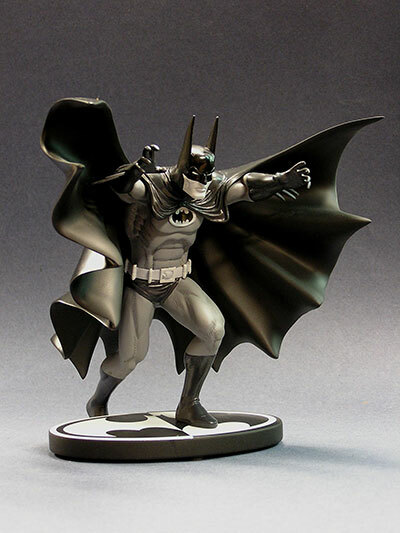 I'm looking at the sculpt on two levels: Is it a good stand alone sculpt of the Batman? Is it a good representation of Roger's drawing style? On the first issue, yes, it definitely delivers a dynamic-looking Dark Knight in a menacing lunge at the viewer. The cape has an abundance of detail and folds to give it the necessary flow to complete the feel of frozen motion. On the second issue, there are certain properties that a Marshall Rogers Batman must have in order to make it a Marshall Rogers Batman and this guy has them. The elongated ears are here starting wide at the cowl-base and tapering into points at the top. The cape is Dracula-like, another signature feature. And the anatomy is defined but not overly muscular or exaggerated. The hands and huge glove-fins are all in keeping with the artist's style. The mouth is closed and I'm okay with that. With this pose, they could just as easily have gone with an open mouth - but the simpler the better in this case. One issue I do have is with the legs. It's as if they are foreshortened in order to give the leaping pose a forced perspective. While probably anatomically accurate, they seem a bit squatty. 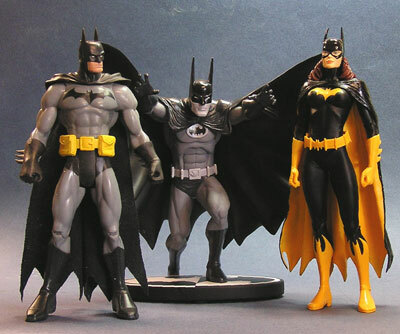 Also the batcrest is a separate oval resting on the chest. It has a rim around it for some reason. I feel this piece would have been better served by a flat, painted batcrest. For those two minor points I'm docking it only half a point. Painting this entire line in grey scale has to be a challenge. I really like what they have done this time. 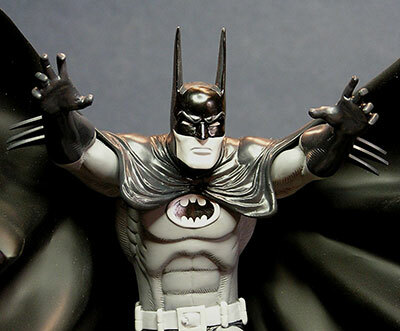 This version of Batman has the familiar 70's black section around the eyes and nose. To truly interpret this into a grey scale, this portion should be and is the only black part (with the exception of the bat emblem). 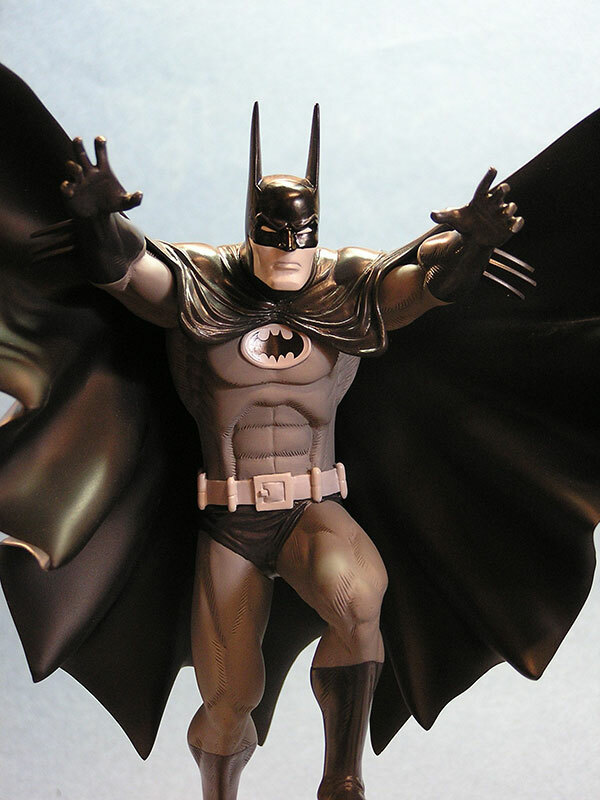 All the other dark areas (cape, cowl, trunks, gloves and boots) are a dark grey. 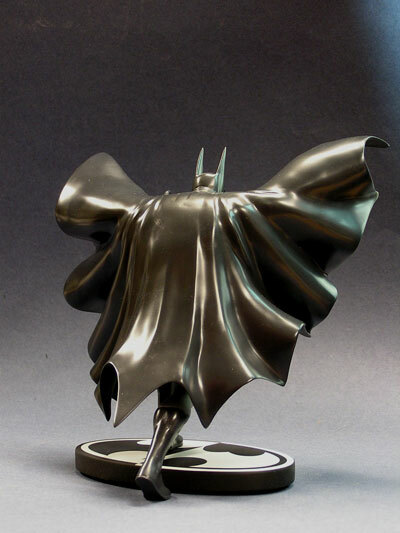 However, the inside of the cape is void of the gloss varnish that covers the other dark areas. This breaks things up just enough. The face area is one uniform shade. Given the history of this series, I find this to be a plus as well. The eyes are of course the only pure white to be found on the figure. The overall paint ap is clean and slop-free which is what we expect from this series. As with the Aparo version before, only one foot rests on the logo-shaped stand. 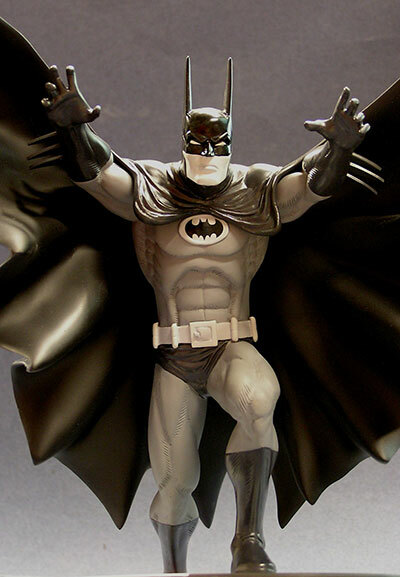 In this case, Bats' right foot rests on the surface behind the stand. Two rods assure that the figure is securely attached to the stand. Cape, arms and legs are all positioned in a forward thrust which makes this pose dynamic when viewed from the sides as well as the front. I have to agree with Michael. These statues don't have the stature to command the high price tag. I was fortunate to get mine for a flat $50 from my local comic book store because it had some minor display damage that I was able to fix easily. For their size that's about right. Inserting the metal rods is simple. There's a short and tall rod in the base. The short one goes in the foot and the tall one goes up the leg. Take care with the ears - they come to fine points and are very exposed. Another thing that I always look for in any limited edition is a low series number. The value is greater and most often the detail is crisper. 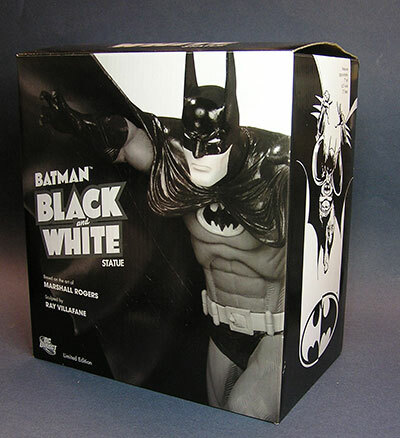 This is not my favorite Black and White Batman so far. That honor is held by the sweet George Perez version. But there is plenty to like about this guy. He'll make an excellent addition to your Black and White bat-shelf. - Mike's Comics N Stuff has it at $70, and right now you can get 10% off using the code "MWC", making it just $63! - Urban Collector has it $64. - Alter Ego Comics has it for $68. - Big Bad Toy Store has it at $70. - Things From Another World has it at $72. - Entertainment Earth has it at $73.50. - Forbidden Planet has it for 65 GBP. - or it’s time to hit eBay. Michael has said he's in for the "long Haul" with this series and has covered plenty of them. My faves include the Mazzucchelli version, the Neal Adams and George Perez version, as well as the Bob Kane, Jim Aparo, and Gotham Knight versions. This product was purchased for the review by the manufacturer. Photos and text by Dan Gates.